Allen B. Downey is an American computer scientist , Professor of Computer Science at the Franklin W. Olin College of Engineering and writer of free textbooks. If you have basic skills in Python, you can use them to learn concepts in probability and statistics. 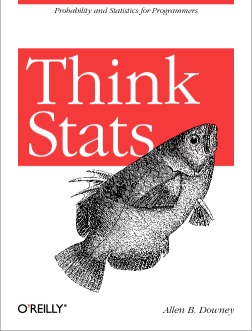 Think Stats is based on a Python library for probability distributions (PMFs and CDFs). Many of the exercises use short programs to run experiments and help readers develop understanding. Most introductory books don’t cover Bayesian statistics, but Think Statsis based on the idea that Bayesian methods are too important to postpone. By taking advantage of the PMF and CDF libraries, it is possible for beginners to learn the concepts and solve challenging problems.